Friends of mine who live in England, keep me informed about the Alpha Program. Four times a year they send me a copy of the Alpha News published in the UK . When the March-June 2004 issue arrived, I noticed a photo on the front page that confirmed my previous suspicions. 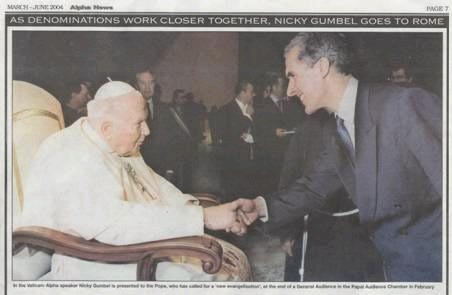 Nickie Gumbel, (Alpha’s founder) was shaking hands with the pope. Catholics and Protestants both claim that Alpha is an excellent tool for evangelism. However, I have one question: who is evangelizing who? Most supporters of the Alpha program in North America just don’t see it. They refuse to accept that Nickie Gumbel and the Alpha program are connected to the Roman Catholic Church and the Roman Catholic agenda to evangelize the world. It was a great honor to be presented to Pope John Paul II, who has done so much to promote evangelism around the world. We have been enormously enriched by our interaction with Catholics in many countries. It is a great privilege to meet inspiring leaders from different parts of the church – Catholic, Baptist, Salvation Army, Pentecostal, Lutheran, Methodist and so many more – and discover that what unites us is infinitely greater than what divides us. Now, at this point, I believe it is important to stop and reason and even ask a question: who is "this Jesus?" While Gumbel is correct in stating that the pope is a zealous promoter of evangelism, what does the Roman Catholic Church mean by evangelism? Further, while the Roman Catholic Church teaches that “Jesus” is the Universal Savior, is the Roman Catholic Jesus (the Eucharistic Jesus that can be resacrificed over and over again), the Jesus who was sacrificed once and for all at Calvary that the Bible teaches about? If you are bothered by the questions that I am asking, please don’t become angry without checking out the facts. Pope John Paul II has called for a “new evangelization” program. The purpose of this program is to introduce the world to the Eucharistic Christ. This "Jesus" can be manifest in a wafer as the body, blood, soul and divinity of Jesus. This occurs when the Host is consecrated by a Roman Catholic priest, and only a Roman Catholic priest. If Gumbel believes the Alpha program and the Roman Catholic Church can partner together in evangelism, then Gumbel needs to clarify what Jesus this partnership is promoting. The Jesus, of the Bible, as He was dying said, “It is finished.” There was one sacrifice, at it was made once and for all, at Calvary. If you are an Alpha supporter, you might want to contact Alpha headquarters (alphacourse.org) and ask for clarification. McDonald and Dusty Peterson. For more information about what is meant by "the new evangelization" you buy "Another Jesus? The Eucharistic Christ and the New Evangelization" by Roger Oakland to be released in June of 2004. Both books are available by clicking on the link below.